Grrrrrasses... 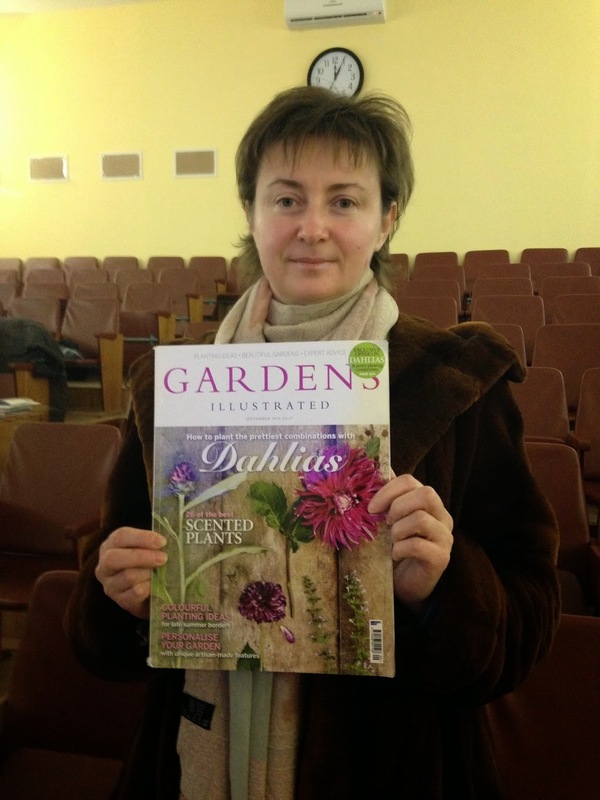 I am writing this basically for the MyGardenSchool students, for whom i wanted to clarify a point which I clearly had failed to do in the material, given how many ask about this - but this is an important issue so I putting it up as a blog post. The point I want to make is about how grasses grow and what this means for us as designers of plantings and as gardeners who have to manage them long into the future. The Achnatherum brachytrichum (Calamagrostis brachytricha) is a good example of a cespitose grass, one that forms a distinct tight tussock. Actually there are many which are a lot tighter, and of course like everything else in nature this is not a hard and fast category. Diversion - it is much easier to think of gradients rather than categories very often when trying to classify natural phenomena: the infinite shades of grey between black and white (joke for workshops - there many more than fifty shades of grey). 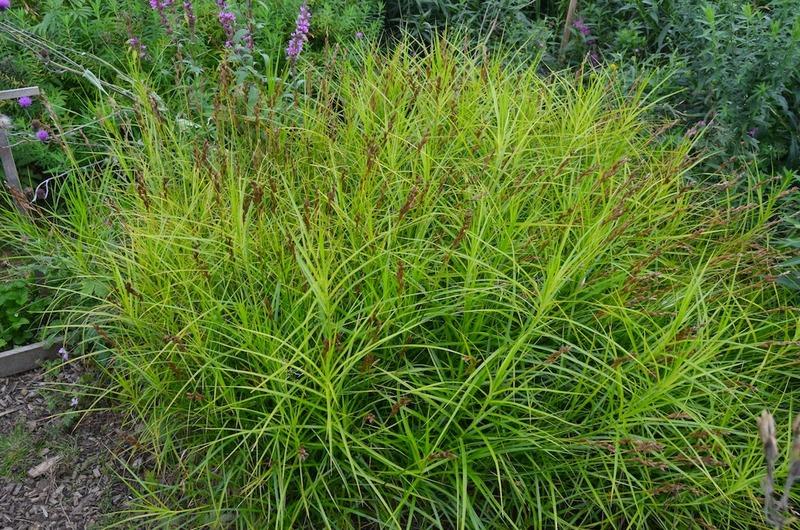 We love cespitose grasses, we like the visual appeal of that neat bunchy habit, and they stay where they are put, unlike many of the older generation of ornamental grasses, that ran all over the place and gave them all a bad name. However, they may seed all over the place - and I am going to come on to that. The one on the left above is an Eragrostis sp. (old pic, lost name - sorreee!). The other is Calamagrostis 'Karl Foerster' raised by the great man himself and pretty much one of the best ornamental grasses we have. Notice how different in habit they are - the Eragrostis stems can all be followed in the mind's eye back to a tight base, so it is clearly cespitose, while the Calamagrostis stems go straight down - that tells you that this is going to be more of a mat former, and it is going to continually spread, in theory, ad infinitum. Cespitose grasses on the other hand, get to a certain size and more or less stay that way, forming a dense tussock. They do grow outwards after this point, but so slowly it can be virtually disregarded. 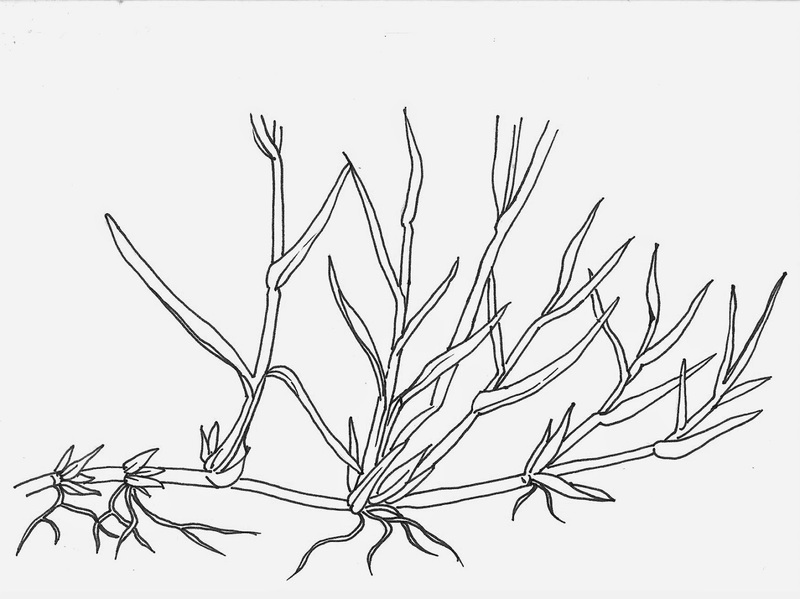 A cespitose grass, drawing thanks to Ye Hang. The bunch - get the point! In the wild, this being Brechfa Bog in Radnorshire. Deschampsia cespitosa on the right is clearly, well yes, cespitose. The rest of the green stuff is a mix of the various turf grasses that are far more typical of our north-west European grass flora. This is how they spread, running through stolons. These turf grasses are at the opposite end of the spectrum to the cespitose grasses. Turf btw, for the Americans = sod. 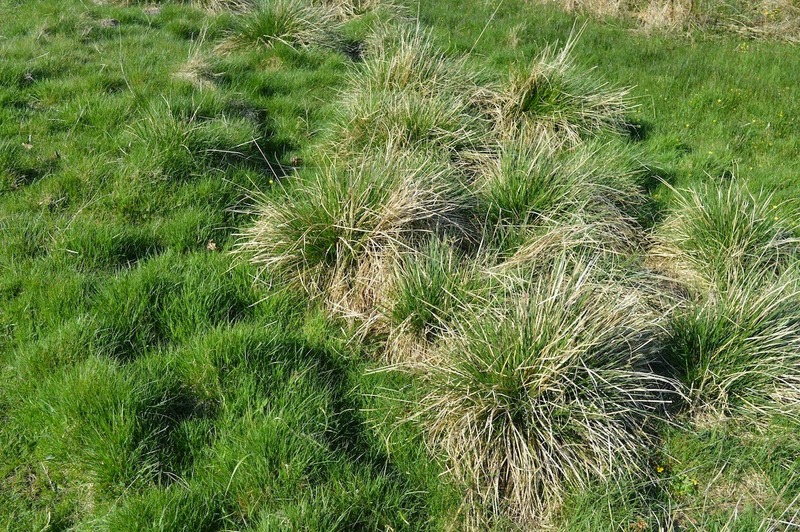 Many grasses are somewhere in-between, and can be called mat-formers, as they spread out at an appreciable rate, but do not charge out like turf-formers. Turf grasses can be mown, which is why are great for football pitches, sunbathing, picnics, croquet, open air theatre, making love on etc and all the other things we do on them. Couldn't do much of this recreational stuff on cespitose grasses. Molinia caerulea - an old clump at Hummelo. See how tight it is, and that very clear edge. Go up to a really old cespitose grass and if you give it a kick, you will appreciate how hard and solid that base is. In contrast, Miscanthus sinensis is a mat-former, slowly spreading, and in this case, leaving behind some dead patches. 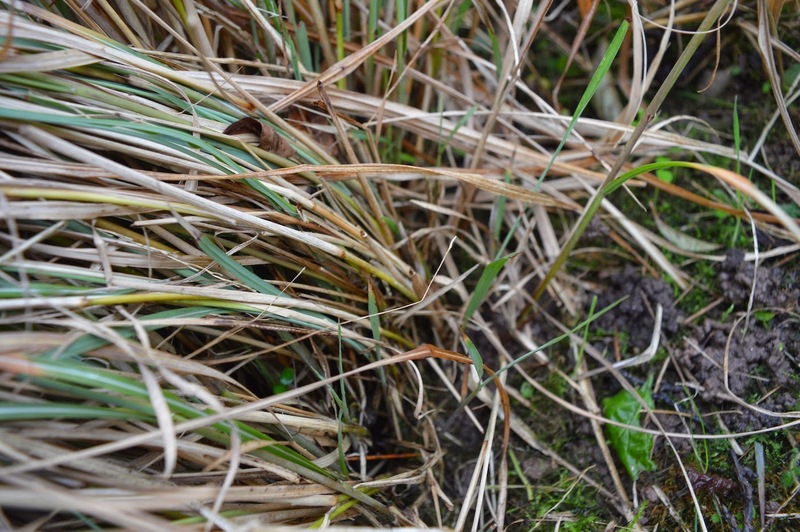 What applies to grasses, applies to sedges too - this is a strongly-spreading Carex glauca (C. flacca). C. muskingumensis is intermediate, forming tight but distinctly spreading clumps. 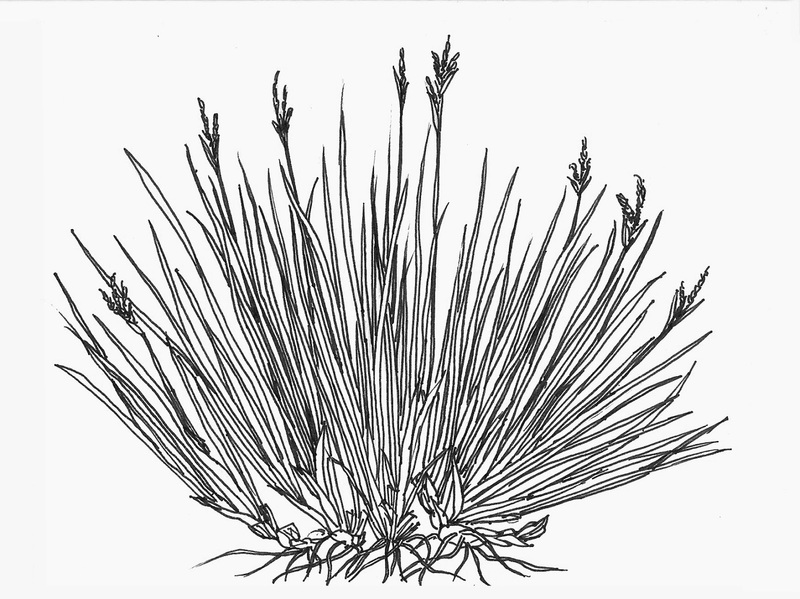 But many sedges are truly cespitose. Nice tidy little chaps these, very decorative. 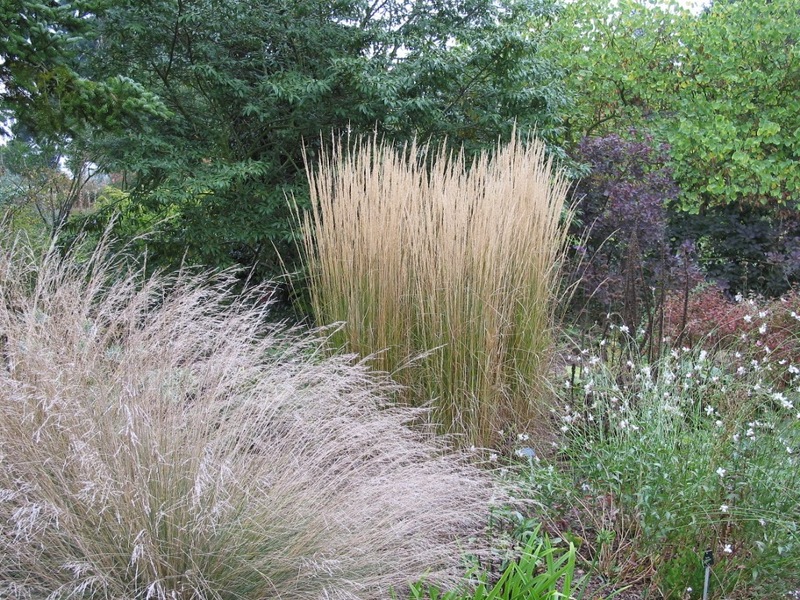 The leading edge of a Calamagrostis and below a Miscanthus, an ill-defined edge, in contrast to the clear end of a cespitose tussock. It is possible to see even at this time of year some new shoots. Stipa gigantea, a good example of a cespitose grass. Ones in older gardens can be decades old, forming great tussocks. Many cespitose grasses are very long-lived. The ruler is measuring out 30cms. Nasella tenuissima, formerly Stipa tenuissima, an example of a cespitose species which is very short-lived, and as you might guess, these are seedlings. It can seed around very freely, but not enough in my garden! Species like these are clearly pioneer plants, the longer-lived cespitose stress-tolerant. Turf grasses are basically competitors. Globally there are more cespitose than turf grasses - but we in northern Europe get a very distorted view of grasses, as our turf grasses are the exception. And of course now they have spread everywhere. What about seeding more generally? Calamagrostis 'Karl Foerster' is sterile, so that is ideal. Nor does it spread strongly. I grew one of its parents, once, C. epigejos, a mistake, very aggressive runner, especially on our moist and fertile soil. Had to get the Roundup out - fast. Miscanthus have gotten a reputation as invasive in some US states. I worry about others, like the Achnatherum I started with here. This Asian species has begun to take over the High Line, so the question will be, how will it compete with the other plants there? Will it establish a balance? Or will it lower diversity? 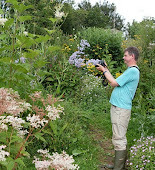 In the garden at home Molinia and Deschampsia are in their element , as they are locally native plants, and do they seed? A lot! To the point where I am beginning to wonder whether I really want them. Or what should we say to clients about long-term management? Or could we end up with relatively stable forb-cespitose grass combinations? Warm-season American or Asian species which do not seed in our summers, even if they are very slow to get going, have huge advantages in this respect. Unlike many forbs, when grasses seed, they often do so in massive quantities. There are lots of questions. I feel we are only just beginning to learn some answers. 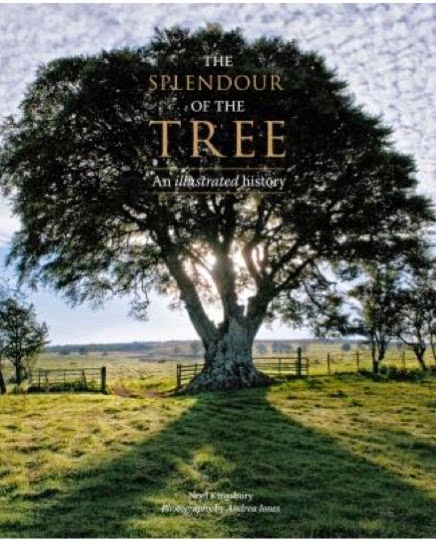 It was Andrea Jones, a photographer and friend, who I have worked with on a number of projects over the years, who suggested that I might like to join her in doing a book on trees. For Quintessence, a 'packager' (a company who puts together a book to go out under a publisher's name); they do good quality books and Andrea had worked with them before, so it seemed a good project to join forces on. So, it has now just been published by Frances Lincoln. I have never been much a 'tree person' though, my focus usually having been on what grows under them, or around them, or indeed if in the Tropics, on them (or indeed in Devon where the epiphytic fern Polypodium vulgare) is capable of sheathing branches as lushly as any fern or orchid in Singapore. The more I thought about it though, I realised that I did actually know more about trees than I thought I did, and crucially, that they had been such a major part of so many of my life experiences. The book has been an opportunity to write in an incredibly free way. There was a lot of trust and very little direction from Quintessence, which can be a liberating feeling for an author. The core and bulk of the text is a telling of information, interesting to me, and I hope to the reader! Trees as objects of human devotion, as ecological beings, as economic resources, as sources of food, as things of beauty. When a friend asked me about the criteria for choosing the, 96 (I think!) species, I had to admit that it was on the very pragmatic basis that I could find enough interesting to write the entry lengths (625 or 1000 words) and still carry the reader with me. The other fact had to be the possibility of Andrea getting somewhere to photograph them, within the inevitably limited travel budget. I had to ransack my memories of trees, and once I started to really delve, there was so much to recall. The swamps of Louisiana we visited, about ten years ago I think, with vast Swamp Cypress growing directly out of the water. Valley Oak in California, with impossibly long branches stretching out into that amazingly beautiful savannah ranch country of the edges of the Central Valley. Cryptomeria in a quiet, steeply-sided valley, just an hour from Tokyo's Shinjuku railway station (the world's busiest), their trunks almost impossibly straight and tall. There have been more prosaic memories too, although for the foreign tourist the sights, noises (and indeed smells) of city life in somewhere like India can never be prosaic: all human life can be seen beneath the majestic Rain Tree and Pipal: circling traffic, begging sadhus, cricket-playing boys, stallholders selling, trade unionists protesting, or the destitute just lying there. I do like the democracy of seeing beautiful trees in 'ordinary' places, and some urban tree planting can create wonderful juxtapositions: Gingko and Dawn Redwood in shopping streets, a young Wollemi Pine next to the skateboard park in Hereford. Researching the species and the places where it might be possible to photograph them was an exercise in itself, its outcomes very much a record of different cultural attitudes to trees. In Europe there are very good ways of finding out where there are notable trees. Britain has the AncientTree Hunt website, a remarkable website which you can search by county and species to bring up, say, all the notable (biggest and oldest) oaks or monkey puzzles in Gloucestershire. Each entry gives size, estimated age, whether it is on private property or not, with a point marked on a map – and sometimes photographs too. It is one of those sites where members may update themselves, which makes me think I should try to get some our local, but unrecorded, good trees on to it. For further afield there is Monumental Trees. Beyond Europe it is a lot more difficult. Notable trees are not as well recorded in North America as you think they might be. Researching good specimens brings us up against the sad fact that many notable trees have been destroyed or vandalised: a well-known golden spruce in British Columbia was chopped down by a psycho in 1997, the tallest Swamp Cypress burnt down by someone high on crystal meth in Florida in 2012. Arboreta and botanical collections often have very good specimens of course, with labels on, and attentive staff, but as Andrea pointed out, we didn't want every picture to be of a specimen in a “tree zoo”. Singapore was indeed the place where I insisted Andrea go to get a good range of tropical trees. There is again, a very good database for good trees, run by the National Parks authority, and a long history of urban garden making. As I got into writing the book, I realised that trees have so often been the background and the context for my closer to the ground horti-botanical exploration, I had so many memories of them. These memories often linked to other circles of context, as trees through their longevity and scale, inevitably impinge more on the human consciousness than shrubs or perennials: they become creatures of folklore, centrepieces for communities and repositories of memory. Researching the book also emphasised just how destructive the human race has been, and in many places continues to be. 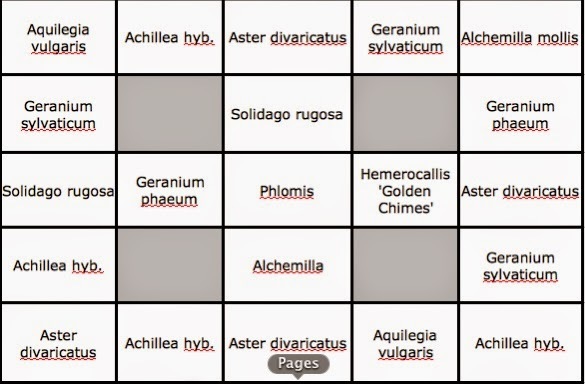 Whilst few tree species have become extinct (in fact, I can't think of any), many have been massively reduced in number, and many older specimens lost to the greed for timber, and the need for farmland. Although we are used to the scale of destruction of the last few hundred years, much of the world lost its trees to much earlier phases of clearing. It seems an odd fact that every culture seems to find some ancient trees to venerate, many cultures also seems to treat trees en masse as an endless resource, or something undesirable in the way of a more productive use of the land. One of the strangest stories in the book concerns the Polylepis, a tree so obscure that it lacks an English common name - this is a species cleared extensively so long ago, by pre-Inca peoples in South America, that it is actually difficult to piece the story together. Humans it seems, find it difficult to cope with anything with a longer lifespan than ourselves. So we tend to see trees as permanent, and forests as always having been there, or of always having had the appearance and composition they do now. I had an interesting conversation the either night with some colleagues in Oslo, about the vast forests of spruce and pine around the city. Apparently most of them were planted.... and much of the southern part of Norway once had lots of oak, which is now quite uncommon. They felled and sold the oak in the 18th century, to the British, who needed them to build ships, our ancestors having felled most of our own, and not thought of replanting them until too late. One thinks of the Easter Islanders, who felled all the trees on their remote homeland, only to trap themselves on their remote homeland by no longer having timber to build boats. A warning to the hubris of the whole human race. My favourite tree in the book? The Longleaf Pine, I think. I remember hearing Janisse Ray talk about the tree at Athens University in Georgia, years ago. I've since visited Longleaf forest a few times, but haven't really explored them as much as I'd like. Their story is one of incredible destruction, followed by a restoration movement which is slowly gaining ground in the South. I like to think perhaps our kitchen table is recycled Longleaf (vast quantities were exported). It is a fascinating story, one of hope and recovery, one I'd like to follow up more. 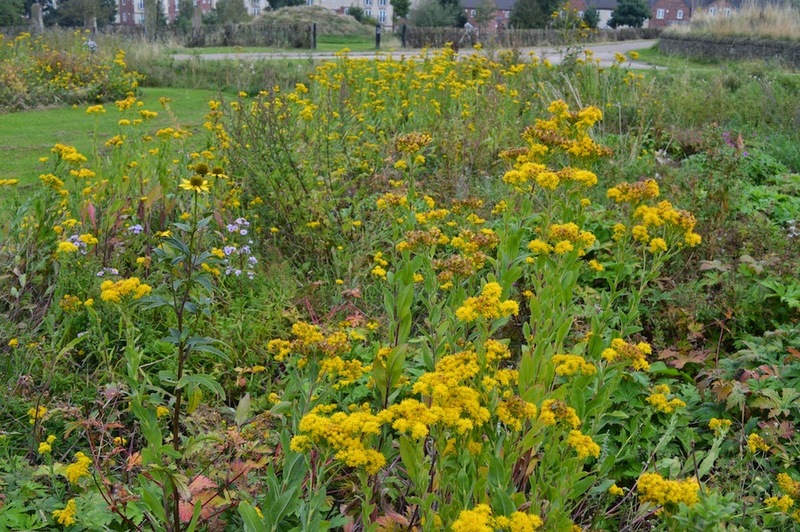 It looks like the goldenrod has taken over, but in fact this is only 16 plants, and they are only about 20-25cms across at the base. 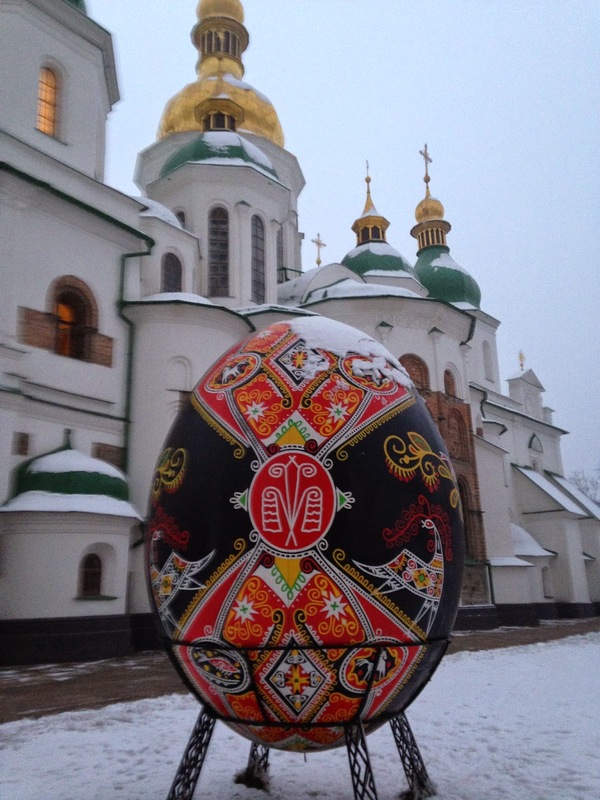 I took the photo a few weeks ago. This area, which is butterfly heaven, finished flowering about a month ago, so it'll be time to chop it down soon. These are actually some research plots, which have just finished their fourth growing season. 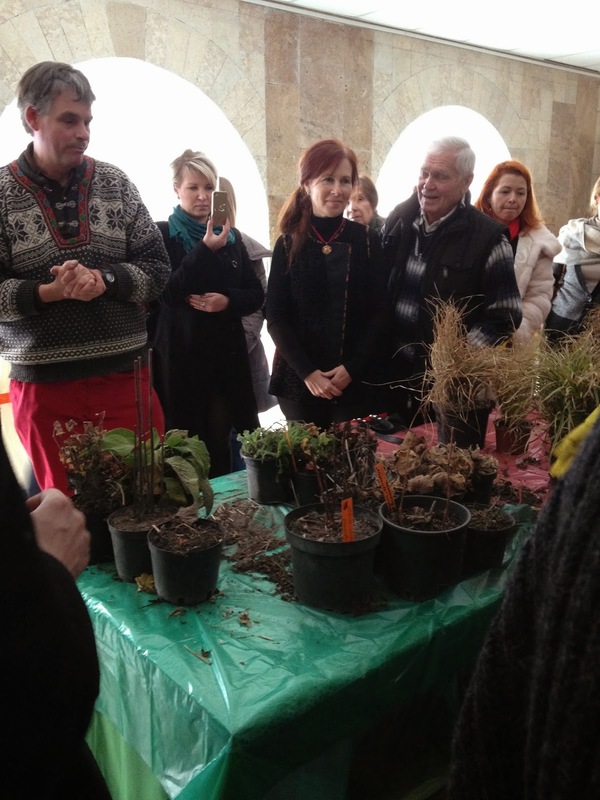 I set them to look at plant competition, and they are proving very interesting. 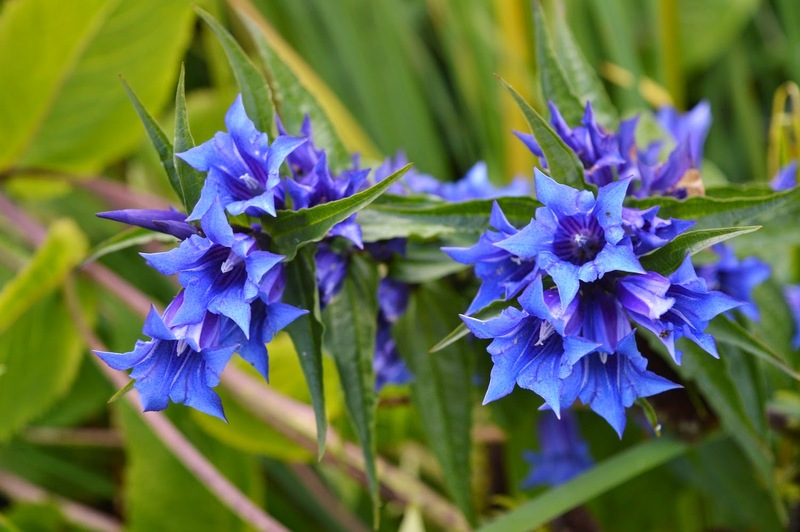 When the RHS trial a plant, they only do so for two years for a perennial, sometimes three. By which time some species are only just getting into their stride, others thinking about packing it all in – so next year one may just get started on throttling its neighbours and another may be dead. 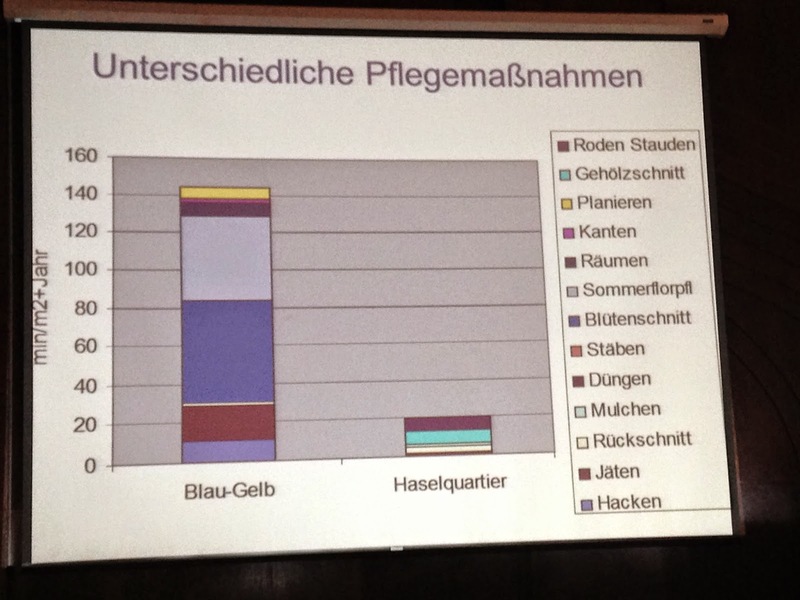 The much more thorough German trials don't last for more than three years either (I think). My intention with this lot is just to leave it there, until it is absolutely clear that we have clear winners and losers – and in fact, I don't think that is going to happen. What seems to be developing is some sort of co-existence. Which is what I have been hoping might happen all along. I want to explain here what I am doing with these plots and why I have them. 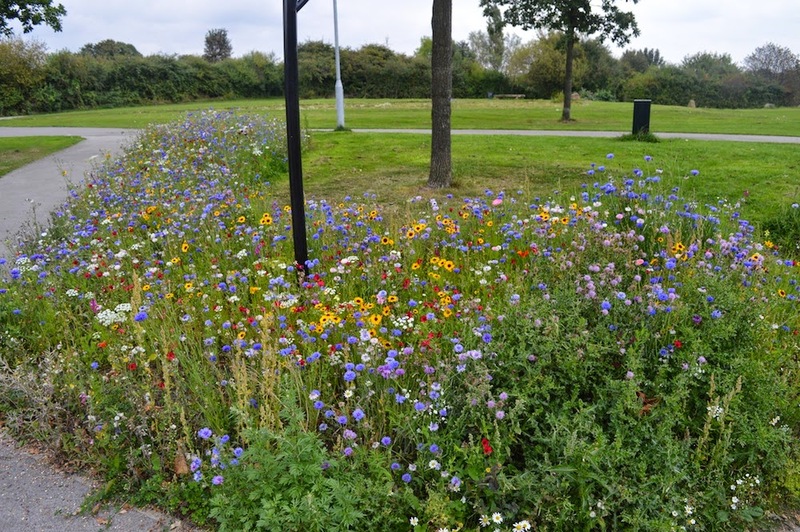 A long-held interest has been to develop plantings which are low-maintenance which local government and other large-scale users could use. And.... this is the big proviso, in the British climate, particularly the wet and mild west. It is an incredibly weed-friendly climate, particularly for our native grasses, which will outcompete 95% of perennials. So - it's all got to be about effective ground cover. My aim has always been to find a combination of species which can so dominate the ground that the grasses, nettles, et al. can't get a foothold. 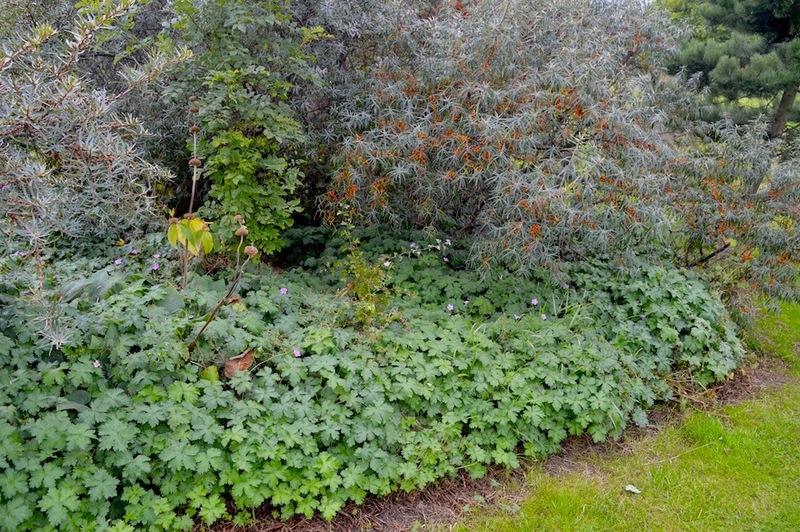 The majority of these effective ground covers: alchemilla, geranium, nepeta etc. species may be colourful but they tend to lack structure. 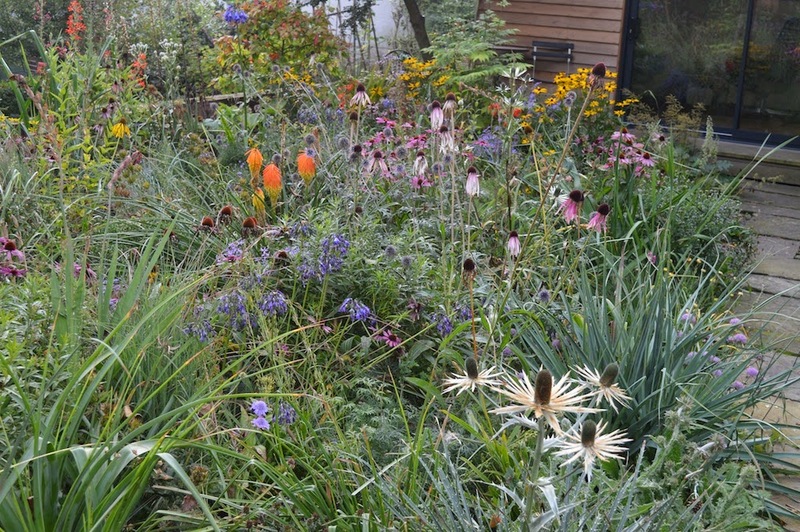 The Piet Oudolf style which inevitably dominates many people's thinking these days, focuses on around 70% structure plants - more upright, with less growth around the base. The problem is, that however much these species may dominate underground - some like Veronicastrum virginicum and Solidago spp. have strong root systems, they don't create shade around the base and are so vulnerable to wild grasses etc. 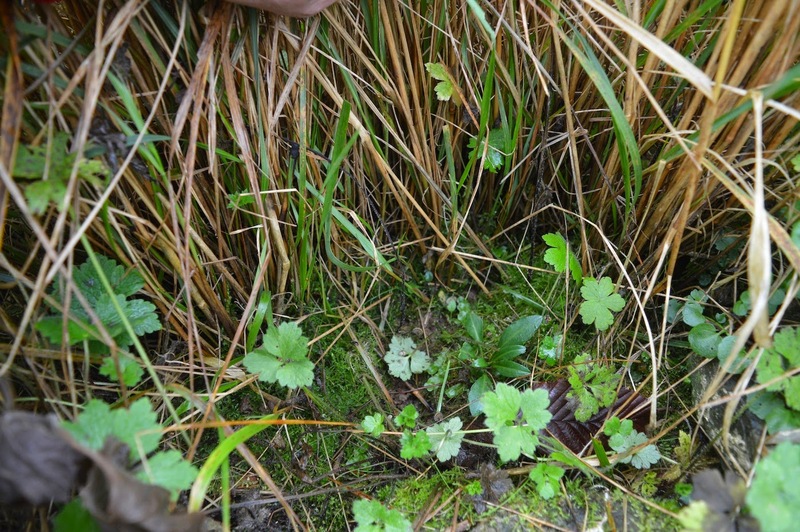 germinating at ground level and then dominating the ground and - worst of all, taking over the centre of perennial clumps, which usually means 'goodbye perennial'. So these species have to be a minority and they have to rise up out of as thorough a ground layer as possible. Getting this mix right is part of why I set these plots up. Plantings at Three Lamps junction, Wells Rd. Bristol, which I did about 8 years ago, they have had little maintenance since (annual cutting back, some basic weeding) and they are looking jolly good! 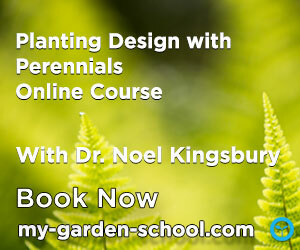 Vindication of a planting strategy based on robust perennials which I am trying to perfect as a planting formula. The iris is included because it has a particularly intriguing habit of 'self-mulching' with its dead leaves which seemed to be a possibly very effective means of controlling competition. Evaluation is done every year end of August or early September. The first two years I did it, but then the last two I have got volunteers to have a go. The thinking is that this might be more objective, and I wanted to see how easy it was for other people to make this judgement. Each plant in each plot gets a grading: 1 for good growth, 2 for surviving, 3 for clearly poor growth or decline, plus of course dead or disappeared plants. Whether flowering or not is also noted. Thanks to Richard Sutton (of Hidcote) and Saskia Gretton Kewley. Of the grasses, only the Calamagrostis has really thrived. The Panicum and Miscanthus have really struggled. This is probably because these are from warm summer climates and make relatively late growth here, and so they are at a competitive disadvantage re. the perennials. 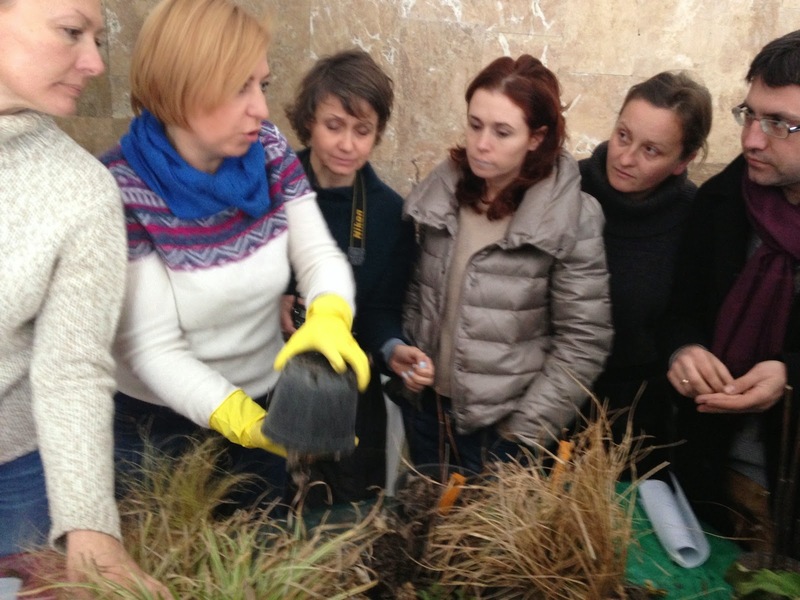 The Calamagrostis is a European species and so can make growth at lower temperatures, i.e. earlier in the year and compete more effectively. The Iris has been slow, and some clumps have not really made it. Again, this can be slow to establish and the faster growth of its neighbours may well have reduced its ability to compete. The Hemerocallis has also had difficulty. Again, similar reasons I think to the Iris. Achillea 'Galaxy Hybrids' have completely disappeared by the third year. Many new achilleas seem to break up and die off very quickly. 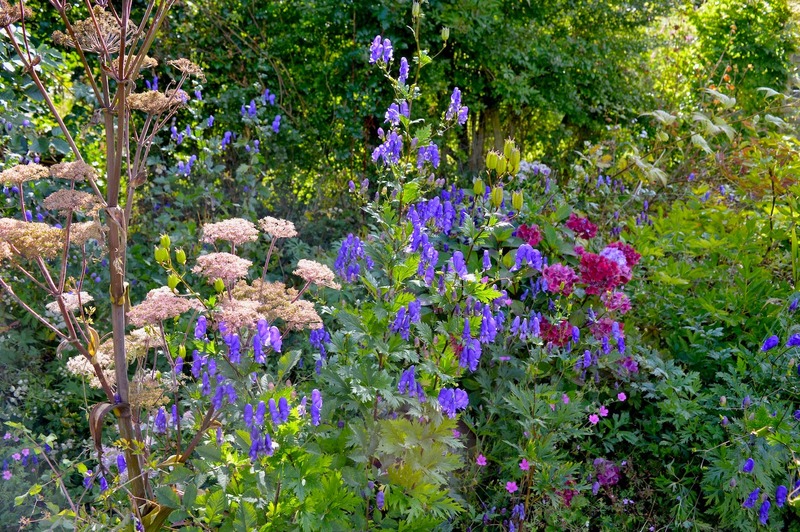 The Aquilegias have 'moved', i.e. original plants have begun to disappear, but seedlings are appearing elsewhere in the plots. Alchemilla mollis is beginning to seed within the plots. Everything else has grown very vigorously. 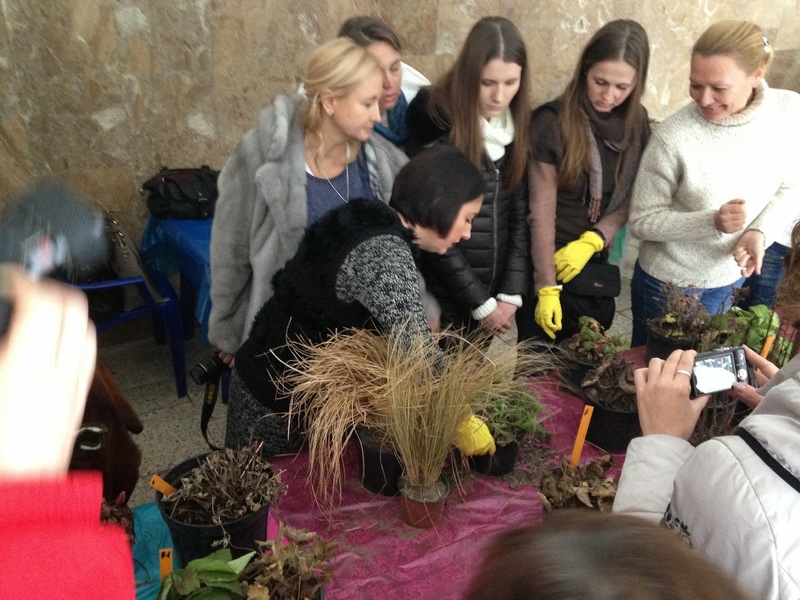 At 7 plants per square metre, ground has been occupied quickly. 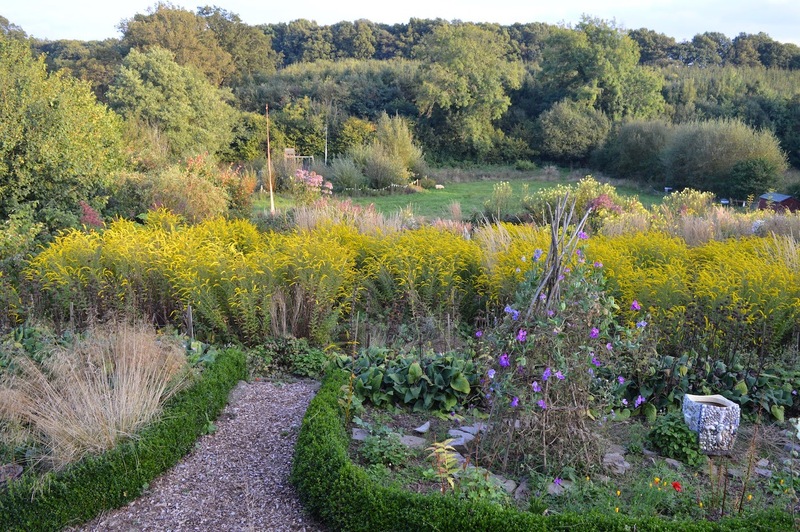 There has been very little weeding necessary – the main weeds have been creeping buttercup, the odd pasture grass and Geranium x oxonianum (from other plants nearby). I would say that these plots have required less maintenance than anywhere else in the garden. The situation now is that I'm ready and willing to try these plots out elsewhere. 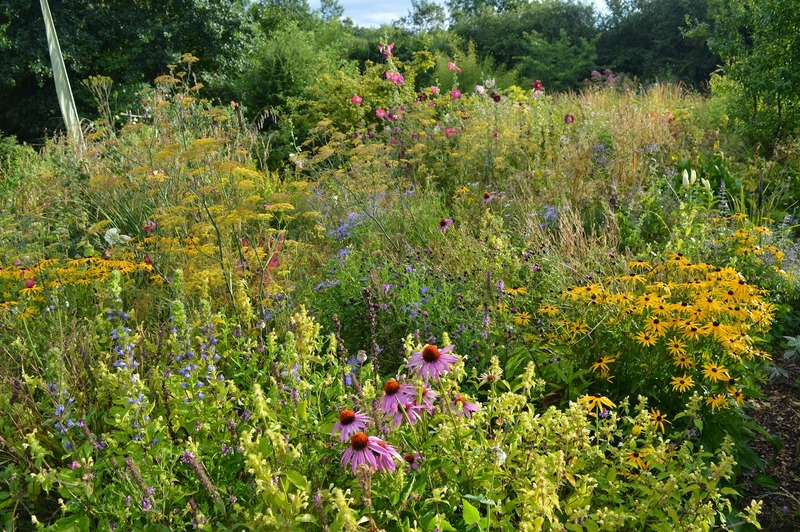 I am trying to persuade a local National Trust property, but finding their bureaucracy painfully slow to negotiate, but have had a very positive response from a major wholesale nursery who are interested in adapting the German model of Mixed Planting formulae to British conditions. Watch this space! Malago Lane, Bristol, an older pic, taken two years ago, but the planting had been there for six. A difficult spot as you could imagine. Can't see the wilderness for the trees. One of the things I love about the US, is the way that you can find places that give you a sense of what the continent was like without any human impact. Can't do this hardly anywhere in Western Europe. There has been much talk lately of 'rewilding'. George Monbiot discussed it in a recentbook which brought the concept to many British readers, while North Americans may have first met the idea in Emma Marris's 'TheRambunctious Garden'. Basically, it is about letting nature rip, re-introducing the wildlife that used to be there, and minimising the human impact. We, in the developed world can afford to do this, as we have a lot of areas our ancestors tried tilling, but we can afford not to, thanks to the efficiency and economics of modern agriculture. Our populations have stabilised too, and of course we have outsourced a lot of agricultural production to the rest of the world. So, it is interesting to be somewhere which already has been 'rewilded'. 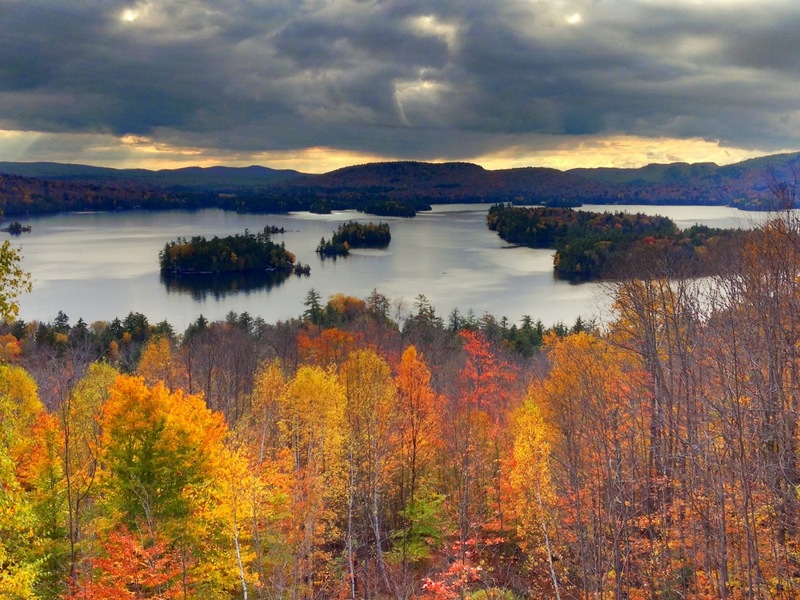 Jo and I have recently had spent six days in a cottage in the middle of the woods in the Adirondacks. This mountain range in the north of New York state was, at the beginning of the 20th century two-thirds cut over by incredibly wasteful and destructive timber extraction. Photographs in the excellent Adirondack Museum show whole hillsides covered in stumps and burnt logs. Since elite tourism began to become a major local industry in the late 19th century, pressure soon built up for conservation. Since then, the area has been a fascinating study in how conservation measures have gradually built up a patchwork of protection – around two thirds of the area is now protected public lands, mostly 'wilderness areas', with no commercial exploitation. Wildlife, including bears and moose, are coming back strongly. Most of the private land is covered in trees too. Woodland in particular has re-established itself with a vengeance. Walking through the woods, it is possible to appreciate the whole succession process. Birches, often the first to grow are being replaced by the longer-lived mature forest species, their trunks littering the ground in some locations. In their place are red maples, hemlock, beech (American beech regenerates from the ground much more so than European) and sugar maple. There are lots of sugar maple seedlings, and this is the tree which is very much the dominant mature forest one in this part of the world. The trees in the Adirondacks are wonderful and this regeneration is truly fantastic to see, but I almost found myself wondering whether the pendulum has swung too far. From the visitor perspective, the trees rather get in the way of the landscape. Hiking trails are almost entirely in the woods, and so after a while become rather monotonous, and driving along it is remarkably difficult to find places to see the distant mountains. And given that biomass is a near carbon-neutral way of providing heat and energy for power supply, surely some careful and judicious harvesting is in order? Or is the no doubt desperate desire of the US government to mitigate its horrendous record on CO2 production a factor here? as the growing woods must still be gobbling up the key greenhouse gas. Or is the idea of rational harvest of trees a cut too far for eco-purists. A corner of James Hitchmough's garden. 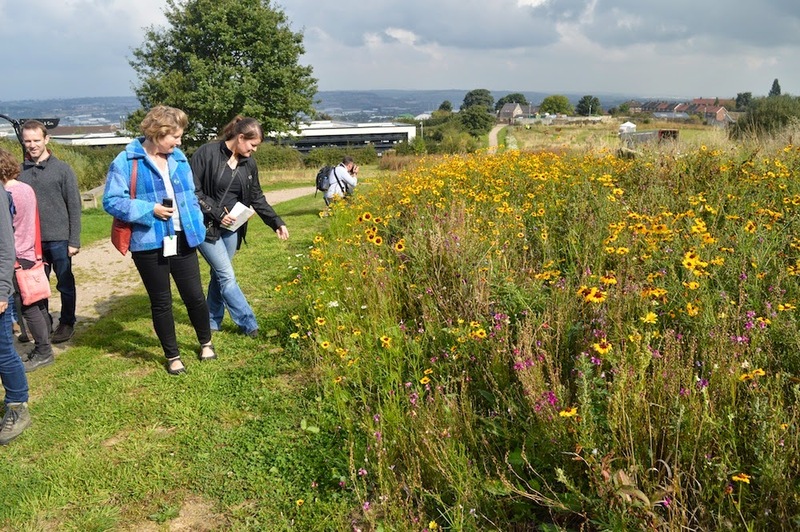 Very interesting to spend the day in Sheffield recently, with a group from the Landscape Institute. 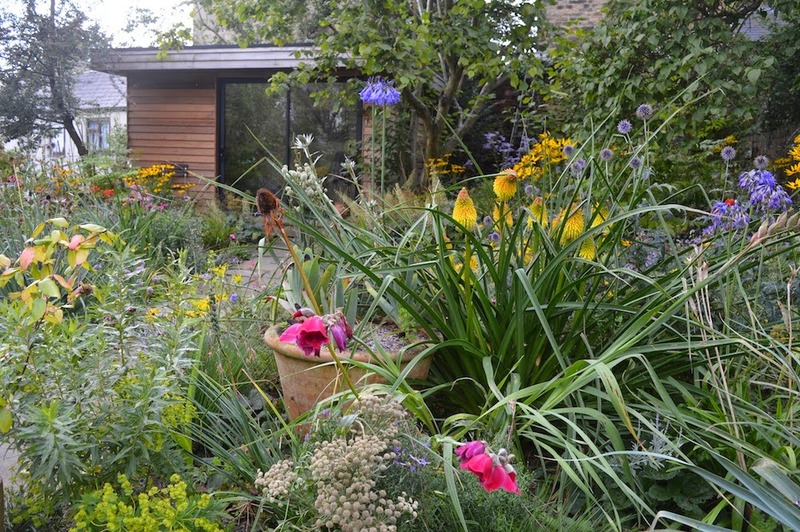 I have a day with the North-East and the Yorkshire group annually now it seems, running a day workshop on planting design. 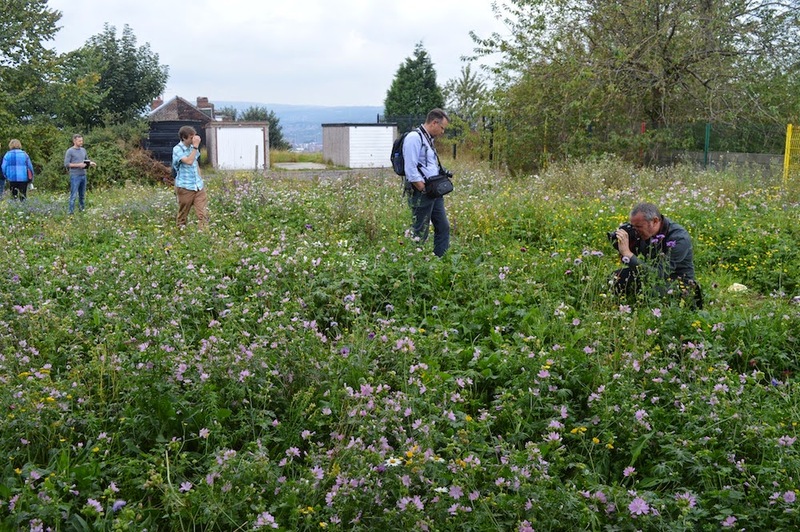 This year we all met up in Sheffield, to see how some of the innovation famously coming out of the university's Department of Landscape gets applied in practice. Another corner - Eryngium proteiflorum in front, the Mexican species James says got him interested in horticulture as a kid. An early morning visit to Prof. James Hitchmough's garden was a good start to the day, with an incredible botanic garden laid out below some gnarled apple trees. 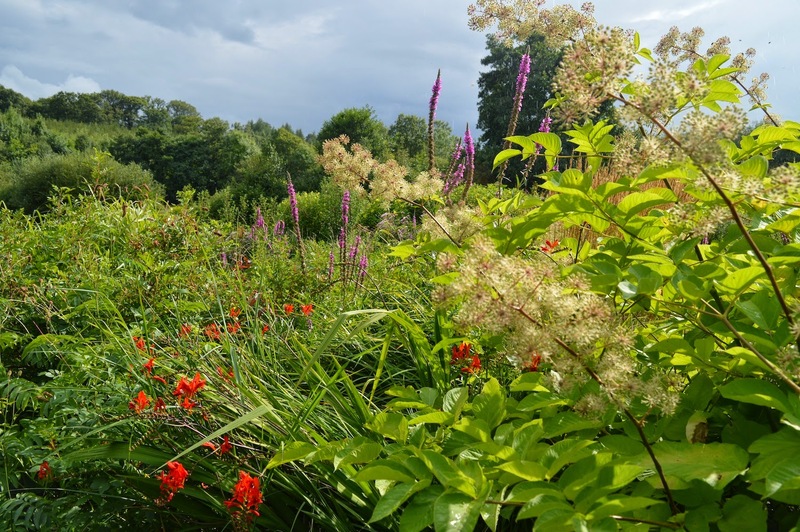 Only a year old, much has been grown from wild-collected seed, and it represents James's cutting edge approach to plant selection with potential to be used in British public spaces – a lot is South African, so it has an exuberantly exotic look. 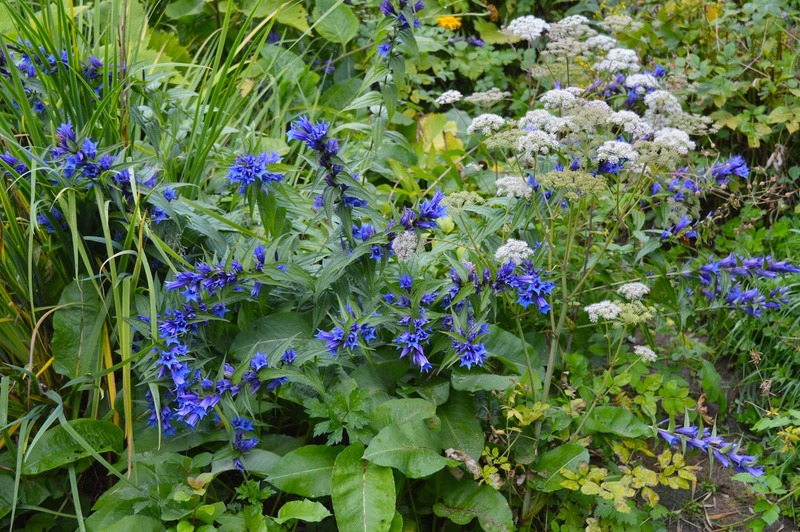 We are so extraordinarily lucky here, in being able to mix and match plants from so many different climate zones, and with minimal risk of anything becoming invasive. Most of the day was spent in south Sheffield, in the Manor estate, a large area of low-rise public housing which used to have the reputation as one of the worst in Britain. 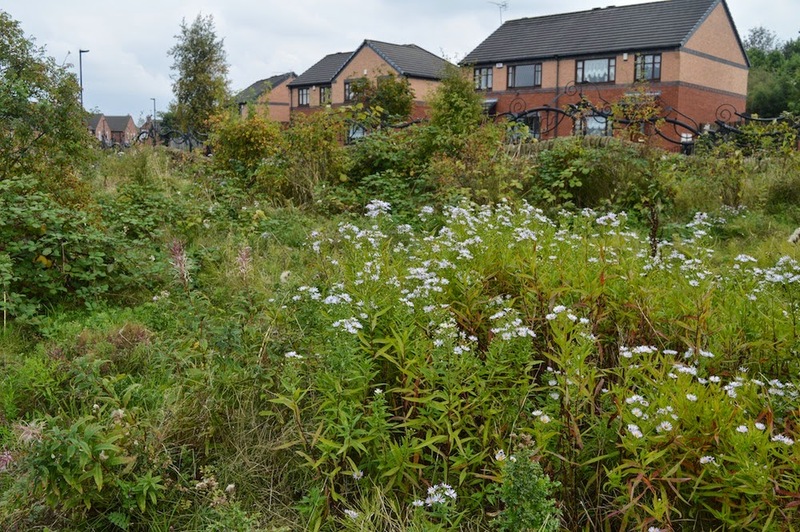 A community interest company, Green Estate, has however helped turn things around, and acted as a way of applying some of the landscape department's innovation into practice. Nigel Dunnett (another prof. at the uni. here) has long used the area as a test ground for his spectacular annual seed mixes, which Green Estate now sell. 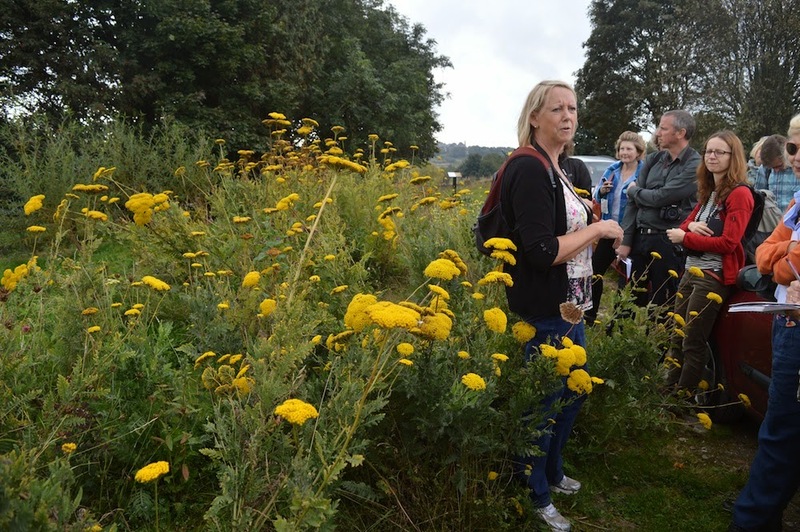 Headed by the amazingly dynamic Sue France, Green Estate is now working on its own seed mixes, which incorporate biennials and perennials and are designed for longer-than-one-year seeded plantings. Not quite sure how long, as the mixes do not seem to have many reliably long-lived clonal species (as you should know by now plant longevity is of many of the bees in my bonnet), but maybe they are just hiding. 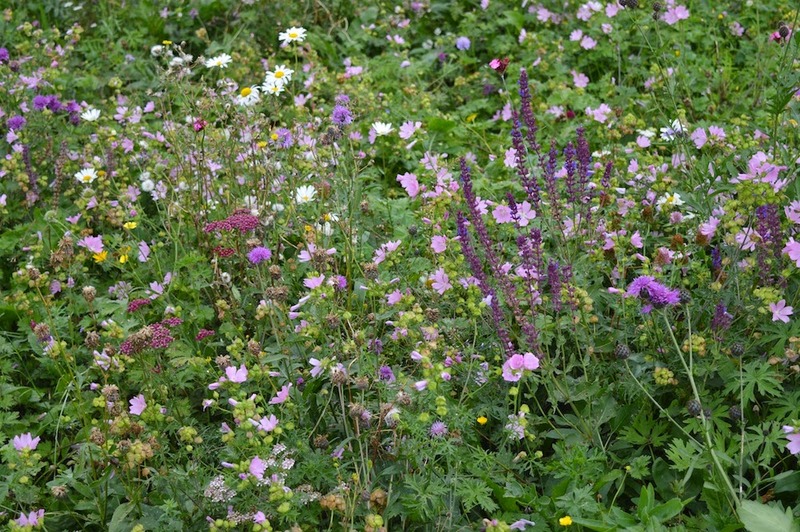 Anyway, inexpensive seed mixes which can be used to create plantings which thrive with minimal care for a few year are a great boon, especially for areas which are 'awaiting developments'. The most interesting part of the day was spent in Manor Fields park, 25 hectares of land which once used to get 350 burnt out cars a year (now it gets none). It is an extraordinarily good example of how to maximise impact with minimal resources. Create a good first impression: the entrance to the park gets a lot spent on it: highly inventive railings and street furniture good enough to count as sculpture, bright annuals, quality perennial planting. Sturdy fencing to keep out stolen cars and dirt bikers. Neat, mown, edges makes wild areas look deliberate. Mowing frequency is maintained, so that all mown areas look very well cared for. “If we have to reduce mowing for any reason, we let areas go wild rather than mow less frequently” says Brian, as infrequent mowing never looks good and creates an un-cared for look. 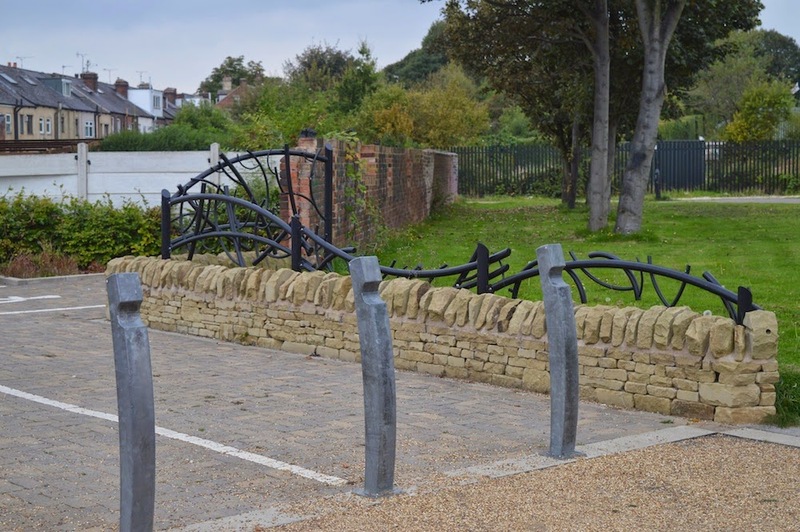 Innovative sculptural street furniture keeps out the hoods driving stolen cars, looks good and makes cutting-edge design truly universal and democratic. 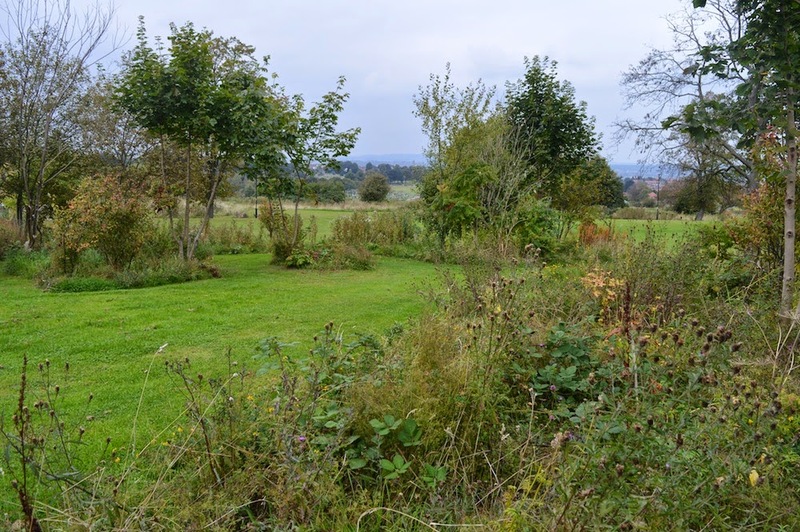 One of the most interesting aspects to Manor Fields, are the perennials which have been naturalised here. 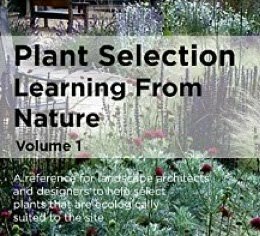 Not many, but they c ertainly make an impact and illustrate the potential of the limited range of perennials robust enough to survive grass competition. 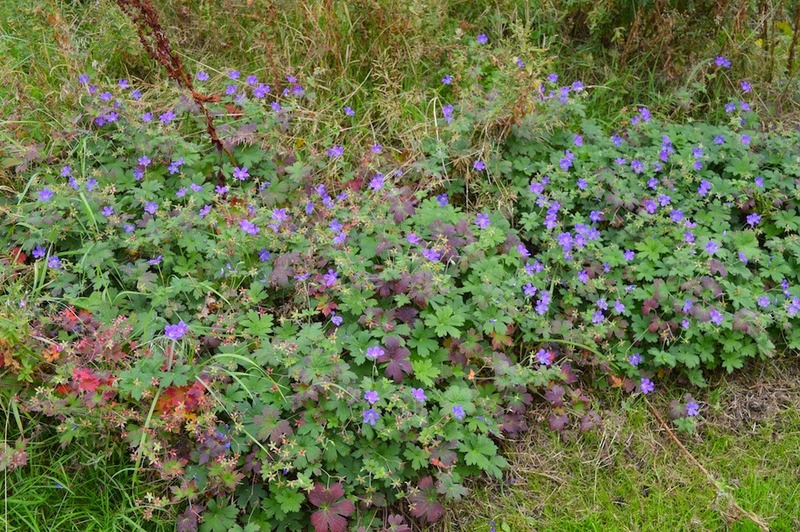 Geraniums under the edge of tree or shrub canopy, where grass competition is reduced, are successful; including the late-flowering Geranium soboliferum, which I have never seen used this way before. Of course some of these here are the outcome of the university landscape department's influence. A goldenrod I have hardly ever seen as a garden plant, Solidago rigida, was clearly doing very well – almost the botanist's thrill of seeing it in the wild! The view above is from our bedroom window, earlier in August. Much the same now except the day lilies have gone over. It seems to be characteristic of a lot of things which flower now to keep on flowering for ages, but often tending to look increasingly raggedy. 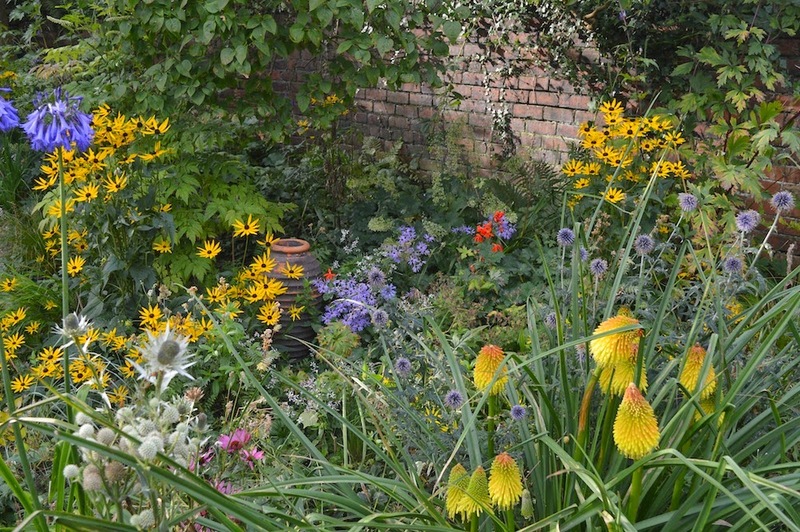 August is traditionally rather a dull month in British gardens, after the early summer rush of (most European origin) perennials and before the (mainly North American) daisy family and butterfly-attended led flurry of autumn. Hollyhocks are invaluable for colour and Rudbeckia fulgida varieties too, for lower-level colour. But there is no getting away from the fact that this is a month when a lot of perennial growth looks very messy. 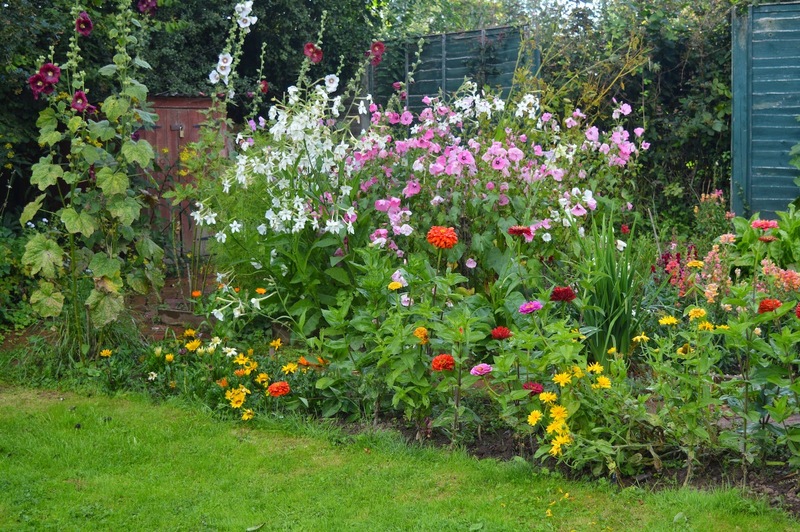 The traditional response has been to rely on annuals, and Jo's lavatera, nicotiana and zinnias have done very well. Echinaceas are increasingly popular for this time of year, but have a reputation for being short-lived, which is quite a difficult one to unpack, I'll have a piece coming out in the Telegraph soon on that; a lot of conflicting opinions on this. I have three left out of ten put in three years ago. They add definition to an increasingly fuzzy plantscape. I'll grow some from seed next year. A very successful part of the garden is where the only hydrangea we have managed to grow (Preziosa) darkens as it fades (you know what I mean!) alongside Aconitum variegatum and our wild Angelica sylvestris, a locally native biennial which is a very nice umbellifer to let loose in the garden although I do wonder at what point I will get fed up with it, so perhaps I'll dead-head some to stop them seeding. The understorey here is Barnhaven primulas which flower in spring and alpine strawberries. Here it is in the Wild Garden where the stalwart Persicaria amplexicaulis has already been flowering for a month or more and will probably carry on doing so for another month. 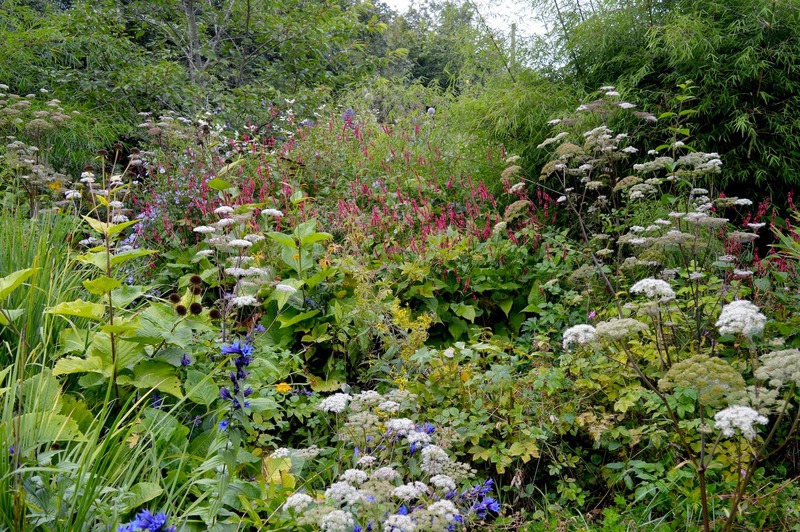 This is the part of the garden where lush and luxuriant growth has the feel of the untidy, almost chaotic, growth that is so characteristic of tall-herb habitats - crazy wildflower habitats we only rarely see as they tend to be inaccessible mountain areas. 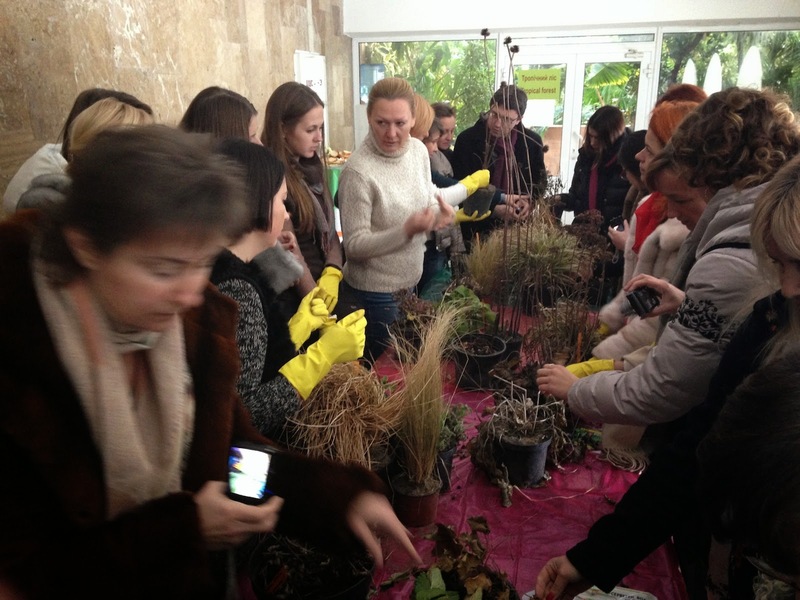 There is a lot of variation in seed-grown plants. This is the best blue so i have saved seed and am now growing lots more. I have fantasies of having them scattered all over the garden. 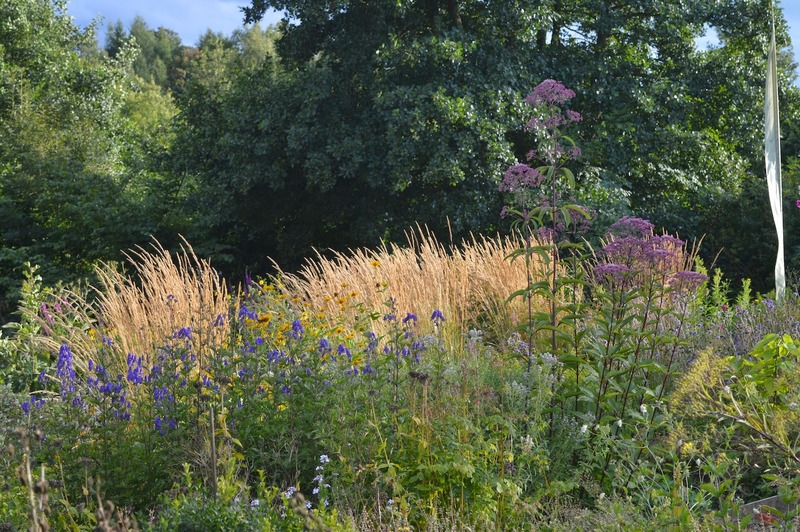 The incredibly good Calamagrostis 'Karl Foerster' as a backdrop to Aconitum arctuatum and a very tall North Carolina collection of Eupatorium fistulosum. 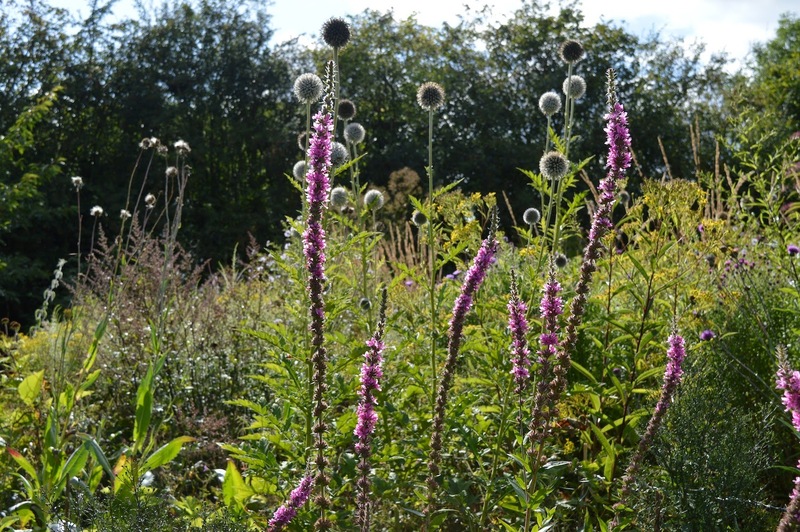 Heads of Echnops 'Taplow Giant' and Lythrum salicaria make good silhouettes in the increasingly low sunshine. This year's big success is Aralia cordata (right) which has taken off amazingly this year, from a slug-beset start. Trouble is, its rather in the wrong place and I'm not sure about transplanting it. The flowers are a terrific resource for pollinators of every kind imaginable.